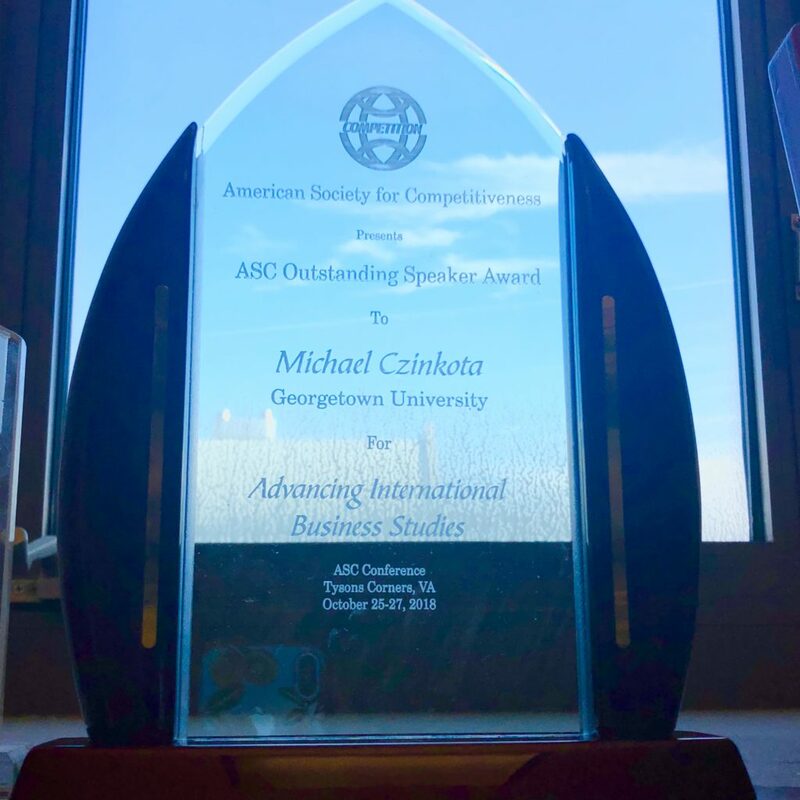 It was a pleasure for Prof. Michael Czinkota to accept the Outstanding Speaker Award from the American Society for Competitiveness. While this award covered the past, Prof. Czinkota’s acceptance speech focused on the future. He addressed the growing role of curative international marketing, where, without a statute of limitation, the length of time for restitution shrinks in importance while making up for injustice is the crucial dimension of thought, behavior, and planning for discernment. Terrorists want more “bang for their buck” by undertaking high-impact events, choosing high visibility targets and directing their violence at less well-guarded “soft targets” such as transportation systems, business and private facilities. Terrorism in the firm’s external environment is designed to create organizational confusion and contextual volatility, which refers to discontinous changes and requires firms to make frequent, abrupt, unexpected, and untested adjustments to their business strategies and operations. There also tends to be a perhaps misleading belief that terrorism responsive decisions must always be made swiftly. Terrorists deliberately target non-combatants and insufficiently protected physical facilities. The globalization of commerce, travel, and information flows have enhanced the ease with which terrorism can be carried out, and increased the visibility and availability of potential terrorist targets. Port facilities, industrial clusters, shopping centers and financial districts are among numerous assets susceptible to terrorism via low-tech approaches. The threat is especially salient to firms with business facilities and infrastructure in multiple and diverse locations abroad, each one of which may need tailor-made protective measures. When evil doers make multiple-tap asynchronous attacks, losses can exceed worst-case scenario planning. Institutions and firms of industrialized nations are most vulnerable when they operate in emerging countries. MNE supply chains are vulnerable to potential long-term harm, particularly with firms whose first and second tier suppliers stretch around the world, in and out of risky environments. Any physical movement of goods introduces risk, disruptions and delays, but in developing nations more so. Perceptions of threats from terrorism reduce the likelihood that firms will expend assets abroad, particularly in emerging economies that might become terrorism-prone areas in future. Companies spend billions annually to manage terrorism-induced risk and comply with terrorism-related government procedures and regulations. Uncertainty is an attribute of marketing environments, particularly in international markets. Marketing activity is vulnerable to terrorism through disrupted international logistics, supply chain and distribution activities, insufficient information flows, and growing global demand for industrial and consumer goods. The complexity formed by linkages among terrorists, producers, buyers, and public actors reflects how with only 3-4 alternatives for each option, terrorism quickly represents hard to control and large number of scenarios. Furthermore, terrorism can trigger imposition of new regulations and procedures, which can hamper corporate activities. Security can reduce but not eliminate terrorism or fully insulate the firm from attacks. Government regulations aimed at preventing terrorism generate delays and increase the cost of business transactions, affecting company competitiveness. The marketing organization comprises a bundle of strategic resources. Abundant material and effective alternative capabilities are traditionally associated with superior performance in international marketing ventures. The payoff from strategic resource stock piles is only realized when management activates situation specific organizational responses and behaviors, aligning them with clear and present changes in the corporate environment, not before. The resource-based view (RBV) helps explain how firms develop and leverage organizational capabilities. Management structures, bundles, and leveraged resources determine the efficiency and effectiveness of company operations and organizational performance and robustness. The allocation of available marketing resources and the creation of new types of marketing tools are fundamental to the creation and maintenance of sustainable competitive advantages. Our research has found that many firms remain ill prepared to cope with terrorism, especially those operating in emerging markets. Firms often still respond passively or only reactively to the outslaught of terrorism. By contrast, we encourage firms to create proactive and innovative solutions for the management of terrorism threat. This is what corporate innovation should be all about. Such innovation must permeate organizational culture and be supported by new knowledge and technology enabling responsiveness to new, outwardly unexpected capabilities. Indeed, strongly innovative firms have highly developed and elaborated knowledge-creation routines and learning regimes. A strong innovative culture supports the firm in developing responses tailor made for rapid deployment with new organizational capabilities. Rather than pursue just unidimensional thinking, ready for one action, firms need to deploy ambidextrous strategies and reinvent the situation specificity of their operations. Thus, management, which possesses a strong innovative culture and substantive awareness of even marginal threats of terrorism, might emerge less scathed from attack from that firms which are focused but limited in their outlook.